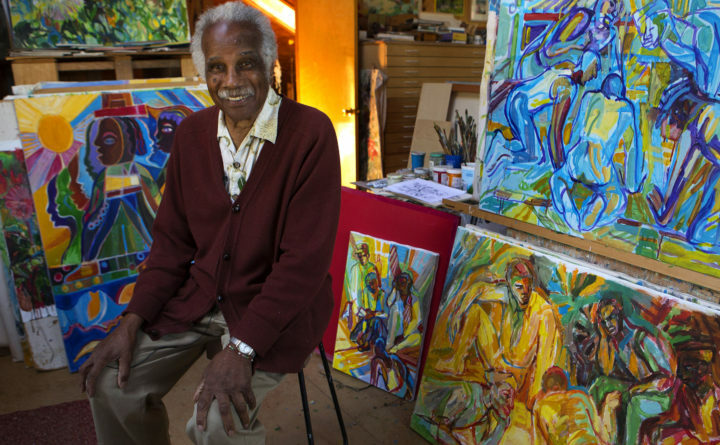 Islesford resident Ashley Bryan poses for a picture surrounded by his paintings at his home in this 2014 BDN file photo. The University of Pennsylvania has agreed to preserve the 95 year-old artist’s personal archive of papers, books, and artwork. 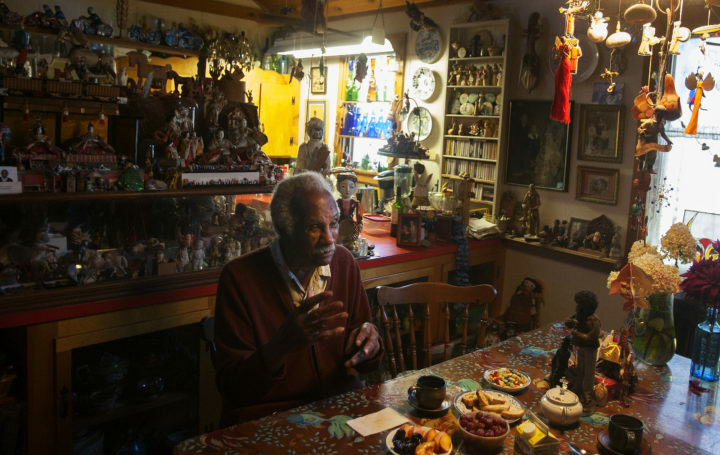 An organization founded to preserve and promote the legacy of 95-year-old Islesford artist Ashley Bryan has found a permanent home for his personal papers, journals, books and artworks. The Ashley Bryan Center has reached a preliminary agreement with the University of Pennsylvania to have Bryan’s archive housed at the university’s Kislak Center for special collections, rare books and manuscripts in Philadelphia, according to the group’s executive director. Bryan’s life as a painter, puppet maker, author and illustrator dates back to his teenage years during the Great Depression, when he was growing up in New York City. Best known for illustrating children’s books, during the course of his career he has won multiple Coretta Scott King book awards and has received a Newbery Honor, the Laura Ingalls Wilder Award and the Virginia Hamilton Lifetime Achievement Award, among others. In 2008, he was named a Literary Lion by the New York Public Library along with renowned writers Edward Albee, Nora Ephron and Salman Rushdie. Islesford resident Ashley Bryan talks with the Bangor Daily News at his home in in this 2014 BDN file photo. The University of Pennsylvania has agreed to preserve the 95 year-old artist's personal archive of papers, books, and artwork. A full-time resident of Islesford, a small island community off Mount Desert Island, Bryan has amassed a large collection of papers, letters, books and personal artworks over the past 80 or so years. He has “thousands and thousands” of drawings, Clark said, many of them from Europe, where he fought in the Army during World War II and then stayed for a while on his own after it ended. He also has dozens of puppets he created from items found on Islesford’s beaches, stained-glass windows pieced together with beach glass, paintings, woodblock prints, cut-paper collages and more. Clark, who knew Bryan through his prior career as chief curator at the Eric Carle Museum in Massachusetts, said the biggest task he faced when he became head of the Ashley Bryan Center in 2015 was to find a way to preserve this collection into the future. He said it took him a solid year to develop a good sense of what in Bryan’s house — which is jammed with books and toys and other collected items — was worth preserving, how much art and writing Bryan has produced over the course of his life, and what has become of it all. Bryan is not known for self-promotion, he said, and has been largely unconcerned with what would happen to his possessions after he dies. Islesford residents, Bryan’s nieces and nephews (he has no children of his own), and others saw the importance of keeping the archive intact, and in 2013 founded the Ashley Bryan Center in part to preserve his life’s work and artistic philosophy, Clark said. After the center started looking for an institution to house Bryan’s extensive personal archive, several colleges and universities expressed an interest, including College of the Atlantic in Bar Harbor and Colby College in Waterville, Clark said. But, after it became clear that the role was better suited for a larger university with a strong research component, UPenn, Emory University in Atlanta and University of Delaware emerged as the main candidates. In the end, it was UPenn’s experience in maintaining such collections and its earnestness for the project that made it the top choice, Clark said. Staffers from the Kislak Center traveled to Islesford to meet Bryan and attended a exhibition of his work last year in Portland. Clark said a final agreement on which possessions of Bryan’s will go to the Kislak Center still is in the works. Bryan has made it clear that he wants the stained-glass windows and the puppets to stay on Islesford, which is where he found the inspiration and materials to make them. UPenn is interested in preserving Bryan’s fan mail and personal library of books, Clark said, but is not expected to take Bryan’s extensive collection of toys. The university is expected to continue to use Bryan’s work to promote literacy in schools in Philadelphia and elsewhere, as Bryan has done himself for decades, and will make sure the information and images in the archive are available to the broader public, Clark said.